You can find all the things you need to know about Basel for a pleasant trip and read the smart recommendations about the city to guarantee an enjoyable time. Culture, history, art, cutting edge technology, gastronomical delights and hauete couture shopping, all these and more await travellers in Basel, a small city that forms the heart of the Dreiländereck, meaning the three countries’ corner, made up of France, Germany and Switzerland. Flanked by the Swiss Jura, the Black Forest and the Vosges this medieval city is today known worldwide as the “cultural city of Switzerland”, as it is steeped in traditions and old world charm, with more than forty museums, ancient architecture and restored buildings. Yet, despite having roots in the medieval times, Basel is also suave and sophisticated offering travellers a host of itineraries for relaxation and enjoyment. Rivalling Zurich and Geneva as a popular tourist destination, Basel is a feast for mind and the soul with all its natural, historical and modern splendours. Your visit to Basel is sure to leave you replete with unique experiences like a dip in the Rhine, a visit to the avant-garde art galleries or viewing the headquarters of pharmaceutical giants like Novartis. While lacking in the glitz and glitter of Zurich, or the grace of Geneva, nevertheless Basel lives and breathes traditional ways of life, promotes and celebrates art and holds events of international repute like its carnivals (Fasnacht) which is sure to leave a lasting impression on the minds of the visitors. Dating back to the pre-Roman times, Basel is one of the oldest cities in Switzerland with hidden treasures to explore at every nook and cranny and lives up to its nicknames of “cultural city of Switzerland” and the “university town”. Bordering both France and Germany, Basel lies on the banks of the River Rhine. The city is in the north western part of Switzerland and falls within the Upper Rhine Euroregion. Your port of entry into Basel could be by road, rail, water or air as Basel is well linked to the rest of Europe by all modes of transport. The only bi-national airport can be found in Basel and is served by over 500 scheduled and chartered flights from more than 150 destinations worldwide. The airport is also very conveniently located, being only around ten minute drive from the city centre. Three railway stations viz. Swiss SBB, French SNCF and German Badischer Bahnhof serve Basel, making it very easy to reach by train too. How to get around in Basel? Though a medieval city, founded in the pre-Roman times, the city of Basel has an integrated and noteworthy public transport network that is well known for being extremely punctual. The green and yellow trams and well planned bus networks will ensure that you can move about in comfort and your travel around the city is without any hassle. As a visitor to the city you might also benefit from using the Basel Mobility Ticket, which would let you use the public transport system for your entire stay. Basel offers the visitors a large number of attractions that are charming for all types of personal interests. All you have to do is choosing from the many sights to see, museums to visit, areas to shop and parks to wander in. 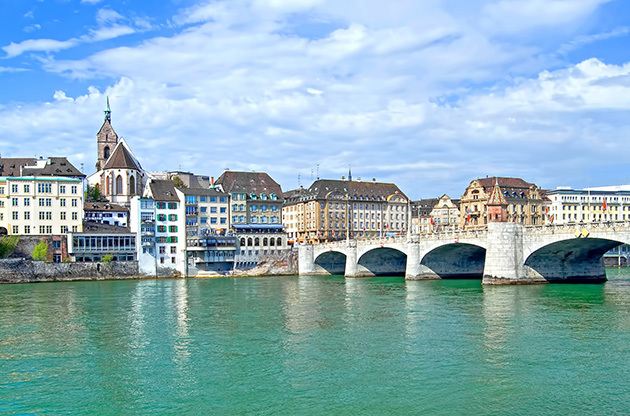 Sightseeing in Basel is never complete without visiting its exhaustive list of museums, listening spellbound to the opera, or taking in the sights of splendid architecture. Some of the must-do things in Basel include a visit to the famous exhibitions hosted by Fondation Beyeler, the Kunstmuseum and Antikenmuseum, which have drawn tourists from across the world by virtue of their exceptional collections. The Theatre Basel offering all three genres of Ballet, Drama and Opera is also a feast for the eyes, as do the quaint art galleries tucked into corners of streets offering a fascinating glimpse of contemporary works. Exploring the Old Town, a walking area between the Basel Zoo and the Rhine is a must too, with the Münster, the Marktplatz and the Rathaus all highlighting the medieval origins of the city. And if you are there during the Basel Carnival of Fasnacht then you will enjoy the “three loveliest days” in your lives. A long stretch along Freie Strasse, Spalenberg, and Gerbergasse, stretching from Claraplatz to Marktplatz is devoted to cater to shopaholics where you can find many exclusive boutiques and speciality stores with a few higher end department stores like Globus. Coop City is another department store near Marktplatz which makes for a good stop to pick up Swiss chocolates. One thing that must feature in your shopping list, to take back as souvenirs, is Basler Läckerli that are delicious local biscuits. If you like shopping off the beaten track then shops in the Heuberg, Nadelberg will definitely catch your eye with their offers of artisan jewellery, curios, specialty items, art, clothes and books. You can also pick up souvenirs at Heimatwerk and at the SBB railway station. Chez Donati, is generally accepted as one of the most beautiful restaurants in Basel and has a fantastic collection of modern art adorning its walls. Reservations are necessary to dine here. City Bar and Euler Bar are popular with the international business community while Café Atlantis at Klosterberg is favoured by rockstars and sought for its electronic music, jazz, rock and roll and is a maze of bars and balconies with great views of the medieval cathedral. Whether a sophisticated cocktail lounge or a fun bar with live music and interesting conversation, Basel has both to meet all tastes. Around Stadtcasino, Steinberg there are lounges that have live musical acts and bars to satiate your thirst. Papa Joe’s is a popular restaurant and a bar which has references to Hemmingway and offers good food. City tour is a must when you are visiting Basel. A city tour would generally start around the well-known Tinguely fountain, and meander through the Old town, bringing history alive before your eyes. The usual duration of such tour is two hours and costs about fifteen Euros per adult. You could also take a city tour in one of the trams and enjoy the historic and famous spots of Basel. When in Basel, a must take tour is that to Augusta Raurica, the ancient Roman town that has been well preserved for posterity. Basel is generally a safe city but you must be aware of your surroundings at all time and be careful of pickpockets while travelling on trams and buses. The permissible age for alcohol consumption is 16 years and public consumption of alcohol is allowed by law in Switzerland. Be on the lookout for trams as they can creep up silently behind you. If you plan to swim on the Rhine be aware of safe entry and exit points and at all times be careful while swimming. Basel has got spectacular hotels and convention centers equipped with the latest tecnhnology which clearifies the number of event attendees that visit the city every year. The city serves as a hub for large scale international events throughout the year. Important congresses, conferences, symposiums, fairs and trade shows take place in Basel and a trip in the aim of attending one of these turns into a leisure tour thanks to the natural charm of the city and the large number of attractions.